Botanical Name: 1. Prunus armeniaca L. var. ansu maxim. ; 2. Prunus mandshurica (Maxim.) Koehne; 3. 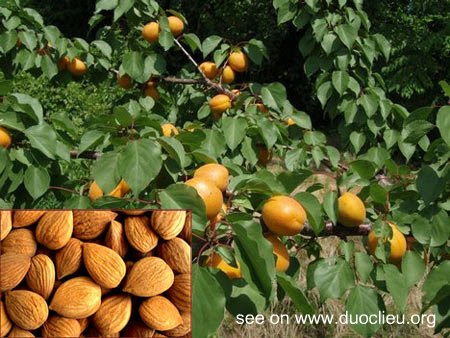 Prunus sibirica L.
Common Name: Apricot seed, Bitter apricot seed or kernel. Part Used & Method for Pharmaceutical Preparations: The seeds are collected after the apricot ripens in summer. They are then dried in the sun and pounded into pieces. Properties & Taste: Bitter, slightly warm and slightly toxic. Functions: 1. To stop cough and relieve asthma; 2. To moisten the intestines and move stool. 1. Cough and asthma: a) cough due to invasion by exogenous pathogenic wind and heat Apricot seed (Xingren) is used with Mulberry leaf (Sangye) and Chrysanthemum flower (Juhua) in the formula Sang Ju Yin; b) cough due to dysfunction of the lungs caused by dryness and heatApricot seed (Xingren) is used with Mulberry leaf (Sangye), Tendrilled fritillary bulb (Chuanbeimu) and Glehnia root (Shashen) in the formula Sang Xing Tang; c) cough and asthma due to accumulated heat in the lungsApricot seed (Xingren) is used with Gypsum (Shigao) and Ephedra (Mahuang) in the formula Ma Xing Shi Gan Tang. 2. Constipation due to dryness in the intestines: Apricot seed (Xingren) is used with Hemp seed (Huomaren) and Chinese angelica root (Danggui) in the formula Runchang Wan. Cautions & Contraindications: This herb is slightly toxic, so overdosing should be avoided. It should be used with caution in infants.